Fort Hamilton the "Army's Ambassador to New York City"
In 1831, the Corps' New York District built the first coastal defense in New York City in the form of Fort Hamilton. Designed and located by General Simon Bernard, Fort Hamilton was positioned so that its guns could supplement those of Fort Lafayette and protect the narrows between Brooklyn and Staten Island. One of the junior officers who served briefly on the project to build Fort Hamilton was Robert E. Lee. The fort was named for the first Secretary of the Treasury Alexander Hamilton. The mission of Fort Hamilton is to provide the New York metropolitan area with Military Installation support for the Army National Guard and the United States Army Reserve. Fort Hamilton is located on the southwestern tip of Brooklyn, New York, at the base of the Verrazano-Narrows Bridge. Take Exit 13 from the Turnpike Cross the Goethals Bridge. Take the Staten Island Expressway to the Verrazano Narrows Bridge. Cross the bridge and get off at the first exit in Brooklyn (92nd Street). Turn left at the first traffic light onto Fort Hamilton Parkway. Follow FHP to the Main Gate which will be on your left at the end of the street. Stay to the right after crossing the Tappan Zee Bridge, get off Saw Mill River Parkway (the name changes to Henry Hudson Parkway then to the West Side Highway). Go through the Brooklyn Battery Tunnel and take route 278 toward Staten Island. Take the last exit before the Verrazano Narrows Bridge-92nd Street. Turn right at the traffic light and go one block. Turn left onto Fort Hamilton Parkway. Take Belt Parkway west to Exit 2, make a right turn on 100 Street and turn right on Fort Hamilton Parkway to Main Gate. Use the New York City transit system "R" Train to the 95th Street Station (last stop). Take the B-8 bus to Fort or walk. Tokens or Metro Cards must be used on the subways, and either tokens or exact change used on the buses. The Port Authority Bus Terminal (Eighth Avenue and 41st Street) New York serves both commuter and long-distance bus lines. Bus and fare information for all carriers call 212-564-8484. Use Flatbush Avenue Terminal, take the Long Island Railroad "R" Train and follow instructions above. For train information call 217-LIRR. Due to its unique location, Fort Hamilton is a combined community made up of active duty Army, Navy, Air Force, Marines, Coast Guard, Reserve Components, retired military, DoD appropriated and Non-appropriated fund employees, contractors, and family members. Many off-post military, reservists, veterans and a large population of retirees also draw support from Fort Hamilton. The post supports a MEPS, Reserve Units, ROTC Units, Ainsworth Clinic, and the NYC Recruiting Battalion. Fort Hamilton temporary lodging is at the Hamilton Inn located at Bldg. 107 and the Hamilton Inn Annex, Bldg. 210. Reservations and information can be obtained by calling (718) 439-2340. The Fort Hamilton Inn is open 24 hours, 7 days a week. There are 46 guest rooms in the Hamilton Inn all of which are equipped with refrigerators, iron, ironing board, blow dryer, microwave and coffee makers. Some have a range. There are two rooms designated for those traveling with pets; one in each facility. Advanced reservations are recommended. Cribs are available upon request. A Continental Breakfast is available at no charge each morning in the Hamilton Inn lobby. 28 rooms are available in the Hamilton Annex. All of which are equipped with refrigerators, iron, ironing board, blow dryer, microwave and coffee makers. The annex is much better for families as it is located in a less congested area with a play area and a large playground. 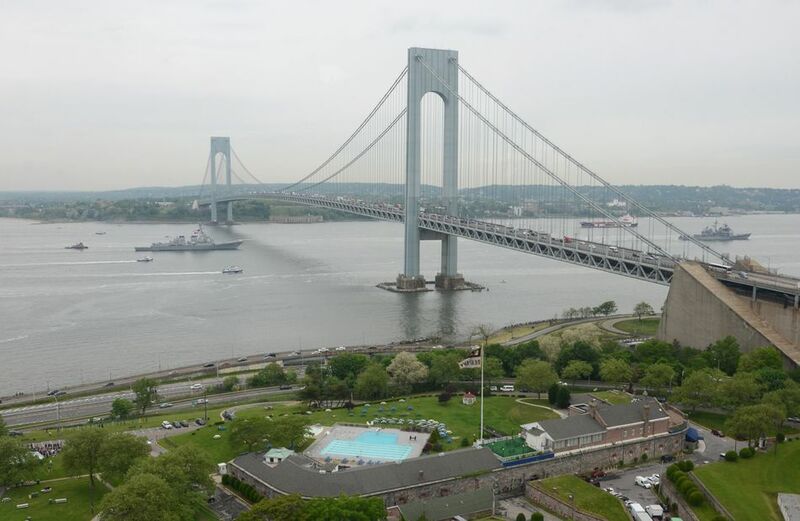 It is located on a bluff overlooking the Verrazano Narrows and is just a short walk from the club (and the pool during the season). Priority 1 reservations can be made as soon as orders have been cut. All other personnel is considered SPACE-A (space available). Space available reservations can be made 7 to 30 days prior to your arrival, based on seasonal requirements. Payments for all transient facilities are payable upon registration. For reservations, contact Fort Hamilton Army Lodging at COM: 718-439-2340. In the New York City area off post, housing is very expensive. Almost 100% of the military assigned to the area which are not from the area, live in Fort Hamilton. You will want to be sure to inquire about permanent housing in advance of your arrival so you can arrange for temporary lodging, if necessary. Single Soldiers should contact their sponsor about the availability of quarters. Married military personnel should call Balfour Beatty Communities at (718) 630-4697 for information about on-post family quarters or referrals for off-post quarters. The Balfour Beatty Communities offers a detailed overview of family housing at Fort Hamilton. The Balfour Beatty Communities office on Fort Hamilton is at 137A Poly Place Apt. 1-B. The wait for on-post housing varies by rank, but most military can move into the apartment complex within a short period. The wait for "townhouses" can be several months. Fort Hamilton does not accept advance applications for family housing. However, eligibility dates for quarter assignment are backdated to the detachment date from your last duty station, provided an application for housing is made within 30 days of arrival to Fort Hamilton. In-processing Soldiers will be asked to provide a copy of orders and any supporting documentation (leave form, marriage certificate, birth certificates of dependents and termination of government quarters, if applicable). The local public schools around Fort Hamilton are very good and safe. Elementary Schools have a Magnet System, where parents can select a school based on the child's interests. The New York City Department of Education is the largest public school system in the United States. With the assistance of the Fort Hamilton School Liaison Office and the following information, you will be able to find the right school for your children. You may choose to enroll your children in public, private or parochial schools throughout New York City. There are numerous schools close to Fort Hamilton that offer quality education to children in all grades, but you are not necessarily constrained to schools closest to the garrison. The enrollment process for public schools varies depending on the grade and program. Families registering children in elementary schools may register at the school directly. When registering high school students, you should call the School as it may be necessary to register at an enrollment office. Enrollment Offices are located in each district. The best advice is to do your research and contact the Fort Hamilton School Liaison Office. Schools vary in size, the age of the facility, and programs offered. There are a number of official and unofficial websites that will give you the opportunity to research any school you are considering. Schools vary in student population size from very small (100) to extremely large (4,000+). There are many specialized high schools available that offer students with a particular interest or talent the opportunity to obtain a unique high school education directly related to their interest. Fort Hamilton is located in District 20, Brooklyn. Central Registration for the Child, Youth, and School Services is located at 404 Sterling Drive. Hours are Monday - Friday from 8:30 a.m. to 4 p.m. The phone number is 718.630.4805. To register your children for childcare, you will need to provide the following: Birth Certificate, SSN, Proof of Residence, Report Card, Medical Records and Current IEP (if applicable). Fort Hamilton Child Development Center programs encourage a positive, loving and nurturing atmosphere in a safe, clean environment which allows children to choose their activities in a variety of learning centers. The Child Development Center is located in Bldg. 218 on Marshall Drive and be reached by calling 718.630.4079. The School-Age Program offers safe, developmentally-appropriate care before and after school, and all day during school breaks. School Age Services is located at 125 Wainwright Drive and can be reached by calling 718.630.4518. The Ainsworth Army Health Clinic is located on Ft. Hamilton at 114 White Avenue. The Clinic provides limited primary care for active duty members and for dependents overseas physicals only. All incoming personnel must report to the clinic to enroll in TRICARE region one. The TRICARE advisor will assist you with all the information, documentation, and knowledge that you need to enroll and seek health care providers for yourself and family members. The Ainsworth Clinic's hours of operation are Monday through Friday, 7:30 am until 4:30 pm. Active duty military should report to the Ainsworth Clinic for sick call. The sick call will continue until all patients checked in by 8:30 am and 1:30 are seen. The clinic can be reached at (718)630-4036. For Emergency care, you should go to your nearest Emergency Room. The nearest Medical treatment facility is approximately a one-hour drive. There are extensive and world-renowned health services available in the civilian community. If you have any questions about your health care while in the Fort Hamilton area you are to call (718) 630-4129 or DSN 232 -4129. There is no dental care provided at the Ainsworth Clinic for active duty military. Military personnel seeking care must go to the Ainsworth Clinic and request a form to bring to the Veterans Affairs Hospital, which provides dental care to active duty military. Family members will need to find a provider who accepts your dental/health coverage.